A long time ago we used to be friends. The Veronica Mars movie is a pretty good episode of the Veronica Mars TV show. I'm not sure if it's a very good movie. I watched Veronica Mars when it aired on UPN/CW from 2004 to 2007 (we used to be friends). I liked it a lot: smart writing, interesting & complex characters, a winning cast, mysteries just compelling enough to keep me invested. But then the show went away for seven years and I haven't revisited it. Like the title character in this new feature film adaptation, I moved on. Since its cancellation, there has been the constant specter of a feature film that would continue the story and find out what became of Veronica -- last seen casting an unsuccessful vote for her father in an election she had ensured he would lose -- all the citizens of Neptune, CA, both good and bad. Fans (apparently now known as "marshmellows," because everything has to be a thing) clamored for it, but the studio passed and things stalled out. When news broke that series creator and the movie's co-writer/director Rob Thomas and star Kristen Bell had taken to Kickstarter to crowd source the project, I was hopeful. I liked the show, and I would gladly spend two more hours with some characters I missed. When the movie was funded in a matter of hours (its $2 million goal met; it would eventually raise about $4.5 million), my hope graduated to excitement. The people had spoken. The system worked -- fans proved they would be willing to spend money to see a Veronica Mars movie and would be rewarded with a Veronica Mars movie. It's been nine years since the events of Veronica Mars' third season. Veronica (Kristen Bell) has long left Neptune, CA and is interviewing with law firms in New York City. She is still dating Piz (Chris Lowell), who now works as a DJ. She is called home to Neptune by her ex-boyfriend Logan (Jason Dohring) after his pop star girlfriend is murdered and he is named as the prime suspect. Before long, Veronica is up to her old tricks, seeing familiar faces and starting trouble for just about anyone with something to hide. Any time a TV show makes the leap to features (and it hasn't happened that often, probably because so few attempts have been good), it requires that the property be recontextualized -- not just for non-fans who might see the film with no prior knowledge of the show, but to justify the leap from the small screen to the big one. Television and film are very different mediums ( --Patrick Bromley, F This Movie!). What is good is not necessarily good for the other, not even in this age of highly cinematic TV and movies that are so sequalized and spun off that they resemble "episodes" more than films. Unfortunately, Thomas hasn't come up with a real reason to revisit these characters other than "time has passed. "Veronica Mars doesn't really care about pleasing anyone who didn't watch the show -- a sin I'm willing to forgive, since those aren't the people who pledged the funds upfront to get it made -- but the fan service aspect has left the film somewhat complacent. It's not that the movie makes it hard to follow for anyone who didn't watch the show; there's a recap of the series (mostly the first season) up front. It's that the movie makes it hard to care. Because there are roughly 70 episodes of a TV series to set up the characters and their relationships, the Veronica Mars movie doesn't bother with any of that heavy lifting. Instead of drama, there are a lot of callbacks -- here's so and so, and can you believe what this person is up to? and hey, here's a cameo from someone we knew and liked on the show (and who has maybe gone on to even bigger success since). The relationship between Veronica and Logan was so compelling on the show because they genuinely hated each other for a long time, and both Bell and Dohring were great at selling the transition from loathing to attraction to actual love. There's none of that here -- just a few references to them having history. Veronica herself was a former popular kid turned outcast, and the way she both recognized and hated the cool class of Neptune gave the show a kind of prickly anger that never felt fake. There are traces of it all over the movie, but it too is never explained or explored. It's merely a ripple from some waves Veronica started a long time ago. What holds the film together is the titular detective. It's easy to understand why Kristen Bell would lobby so hard to get a Veronica Mars movie made. It's a great role for her, and she's great in it. Veronica can be very difficult, and Bell doesn't try to apologize the character's flaws or make them adorable (that's just a side effect of who's in the role). Her self-righteousness would be insufferable if Bell wasn't so good at winning us over with the quickness and sarcasm of Thomas' dialogue. Bell is good in everything she does; I just wish she would make fewer When in Romes and The Lifeguards and You Agains and Stuck in Loves and Couples Retreats. Actually, it now occurs to me that we have to make Veronica Mars a hit just so Bell can keep making these movies. It will stop her from accepting any other jobs, and she clearly needs to be stopped. Equally good is Enrico Colantoni as Veronica's private detective father Keith Mars. Their relationship was always the backbone of the series, and the two actors make the most of their every scene together. Colantoni doesn't get nearly enough screen time in Veronica Mars, but he's so great and his presence so deeply felt throughout that it feels like he's in the movie more than he is. I have always loved that you could draw a straight line from the kind of girl Veronica Mars is to the kind of parent she has. Colantoni gets the movie's biggest laugh and several of its best, most believable dramatic moments that come down to nothing more than wanting a phone call returned. Halfway through the movie, my wife turned to me and asked "Why isn't he in more stuff?" It's a good question. Hollywood, please start using Enrico Colantoni more. K thanks. I realize I've written this entire review and it sounds like I didn't like the movie. Not true. I liked it, but I liked it as the continuation of a TV show I liked. There's nothing about it that feels particularly cinematic; Thomas hasn't opened up the scope or even changed up his visual style for the feature version. I know there were budget limitations, but it really does look and feel like an extended-length episode of the show. Still, the spirit of the thing is present and the movie is true to most of the characters, even though it tries to serve too many of them. What ultimately matters is whether or not Veronica Mars will please the fans. As one of them, I can say that it does. It takes the things that were good about the show and keeps doing them. It doesn't offer much closure. It hardly even gives us a progress report as to who these people are now, as it's really only the occupations that have changed. I'd like to think that's one of the movie's deliberate themes -- people don't change and whatnot -- but Veronica Mars doesn't really concern itself with theme. It's too busy making sure the fans get what they want. Because they are both the audience and essentially the shareholders, I guess Thomas' only responsibility is to them. 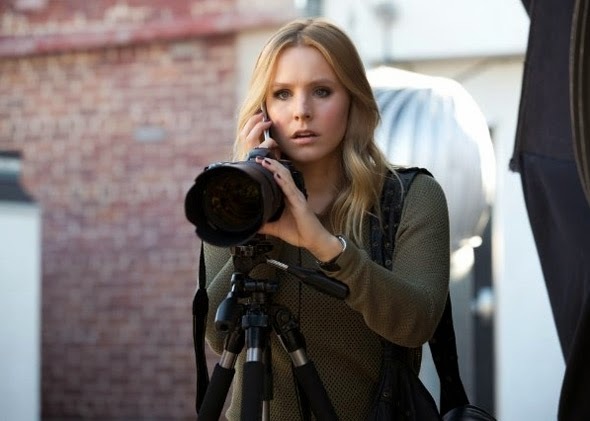 I can't recommend Veronica Mars to newbies, not even as an entry point -- it's the kind of movie that needs to be watched after seeing the series, not before. After spending less than two hours back in Neptune with Veronica and her dad, I was anxious to go back and rewatch the show. Clearly they did something right. The movie is perfectly watchable and entertaining if you do come in cold, but without any kind of emotional investment it just plays like filler. The TV show was never filler. The movie shouldn't be either. One the film got funded, I wanted to rewatch the show with my wife (who hadn't yet seen it). You are right about this film feeling more like an extended episode than a movie (though the occasional bad language lets us know it's a feature). That's why I was happy to be able to watch this at home instead of the theater. Perhaps at the movies the film's low budget would feel a bit more noticeable than in my living room, but overall I greatly enjoyed it. There may be some things still left open when the end credits roll, but the film has a closure not felt in the series (since the final two episodes of season three never were filmed and just abruptly stops). I can at least feel satisfied where this film ends. That being said, even rewatching the show prior to the movie, still made me question who some of the characters were, especially since a few were recast from the series. Wish Rob Thomas would have just changed those character's names then. Also, not a fan of Jamie Lee Curtis' character stating that Veronica got her P.I. license when she was 18, when it was 19 in the series and Veronica does not correct her. The film does return the series to a more character driven mystery, though I would say there is far more comedy in this than there ever was in the show. Much like Serenity, one can enjoy this on its own, but knowing the show beforehand just gives the whole film purpose. Great review, the movie just made me feel all warm and fuzzy to be back with the Mars family. And in regards to Enrico Colantoni, he has one of my favorite scenes in one of my favorite comedies of all time, Dave Foley's 'The Wrong Guy'. It's only a couple minutes long but, go watch The Wrong Guy, y'all!